The theme of Hello Zindagi released last week, is the need for conserving Olive Ridley turtles. That's a rare enough storyline for a commercial movie, but what makes it stand out is that it has been sponsored by India's largest steel maker Tata Steel. Tata Steel's debut in film production isn't surprising, as the steel company has been facing severe criticism from environment conservation group Greenpeace, which says the construction of the Dhamra Port will be a threat to the habitat of the rare Olive Ridley turtles -- a charge the company has denied strongly. 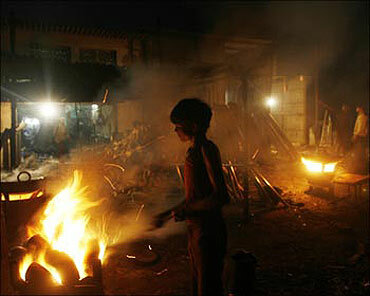 Image: A boy works inside a metal smelting workshop on the outskirts of Mumbai. Dhamra Port Company is a 50:50 joint venture of Tata Steel and Larsen & Toubro and has been granted a 34-year lease by the Orissa government to operate a port in the state. A Tata Steel spokesperson says Hello Zindagi is a part of Tata Steel's corporate social responsibility and the company is not looking at getting any share in the profits that the film makes. Tata Steel is following the footsteps of other Indian companies which are using 'save the environment' as the new brand promotion mantra. Some of India's top companies have launched a new line of television commercials that encourage consumers to pay attention to the depleting resources on Planet Earth. No longer is this only about cutting down on emission levels or planting trees. 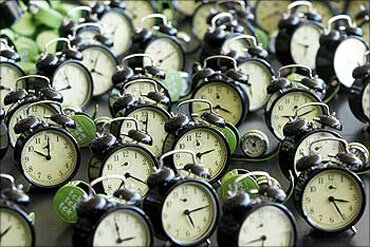 Image: Clocks are seen during the performance - tck tck tck -- by Global Campaign for Climate Action. The 'Planet Ke Rakhwale' campaign, which handset major Nokia recently launched in India, encouraged consumers to drop their unused mobiles and chargers, irrespective of the brand, into recycling bins placed at any of its Nokia Care Centres or Priority Dealers in some cities. Nokia has over 1400 Nokia Care Centres and Nokia Priority dealers across the country. Idea Cellular, as part of its national green campaign, has partnered with coffee chains Barista and Caf Coffee Day to eliminate paper-based menu and bill. At over 90 outlets of Barista and 75 Cafe Coffee Day outlets, visitors can download the menu cards and bills on their mobile phones through a unique mobile application that they can download on their phones. 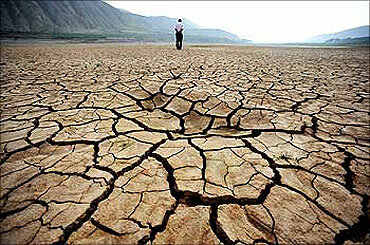 Image: A Chinese man walks on a dried-up riverbed at Huangyangchuan reservoir in Lanzhou. "When brands want to expand the depth of their consumption profile, they think of long-term investment returns and thinking green or recycling is one such idea," explains Harish Bijoor, brand strategy specialist. Nokia started the first campaign in January last year. In India alone, the campaign has been able to reach out to over 28 cities. Idea Cellular smartly tied its paperless bill idea to the promotion of mobile use. The Idea Cellular campaign allows consumers to order by selecting the menu on their mobile. "They can browse through the menu and select the items to be ordered. On completion, order summary is displayed and users can view the bill amount for the items ordered. The user also gets a message - Use Mobile, Save Paper," says an Idea spokesperson. 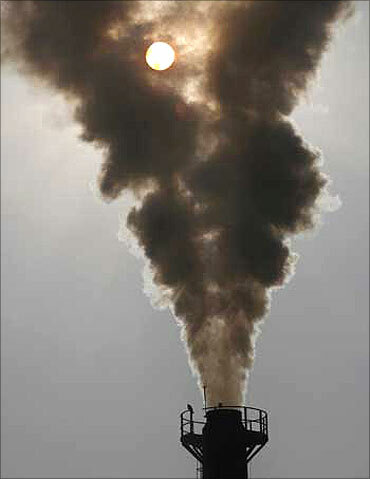 Image: Smoke rises from a chimney of a garbage processing plant at Daddumajra village near Chandigarh. Another such example -- again from Idea -- is the option of paperless travel to Mumbaikars and Delhiites. The first 4,000 people in Mumbai, who SMS'd 'Idea sealink' to 58888, received a thank you SMS which enabled them to travel on the Bandra Worli Sea Link on February 25 using their mobile phones. In Delhi, the first 3,000 people who SMS'd 'Idea Toll' got a free single journey on the DND flyover between 8 am and 12 noon. Additionally, for every handset dropped for recycling, Nokia has also committed to planting a sapling. It has signed agreements with Ahimsa, Chennai, Rotary Bangalore Midtown and the Art of Living Foundation to plant over 35,000 saplings. 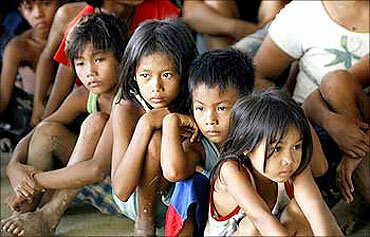 Image: Children from flood-hit town Rosales, Pangasinan wait for the distribution of relief supplies. More than 10,000 saplings have already been planted across Chennai and Bangalore against phones collected in the first phase of the take-back campaign, says the company. Lifebuoy, on the other hand, lives its vision 'Making a billion Indians feel safe and secure' by meeting all their health and hygiene needs. Lifebuoy's Swasthya Chetna is a health and hygiene educational programme that intends to educate people about basic hygienic habits. The project has touched 50,676 villages already. 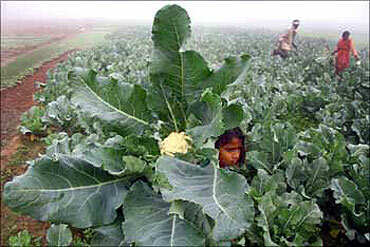 Image: A farmer and his family work at their cauliflower field near Chandigarh. Same is the case with Surf Excel which aired its do bucket paani bachana hai campaign to save water while washing clothes. Another telecom firm Aircel has been working on the cause to save wildlife in general and tigers in particular by partnering with WWF India. 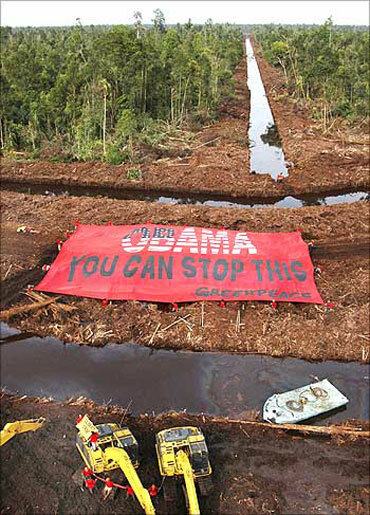 Image: Greenpeace activists display a giant banner during their protest calling on Barack Obama.